A dental bridge is one of the most common ways we replace missing teeth. The bridge is made out of a strong, porcelain material and is completed by using the teeth either side of bridge as anchors. While the material is very strong, it also possesses excellent aesthetic qualities which ensures that they look and feel natural. 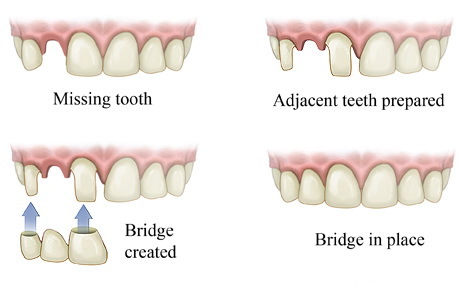 We often recommend bridges when the teeth either side of the missing tooth have either current dental disease or historical fillings as we can reinforce these teeth at the same time as replacing the missing tooth. In other circumstances, a dental implant may be more appropriate.